The Lower 9th Ward of New Orleans is still recovering from the utter devastation caused by Hurricane Katrina in 2005. 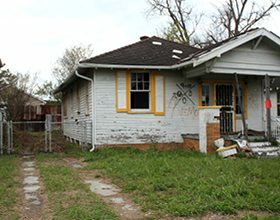 99% African-American, it is the area of the city that was hardest hit when the levees failed and the subsequent storm surge tore houses off their foundations. The 9th ward is the section of the city bordered by the Mississippi River on the south and Lake Pontchartrain on the north. Family-to-Family’s partner organization in New Orleans is All Souls Episcopal Church, led by Rev. Edward Thompson. The post-Katrina church and community center, first started in a garage, is now housed in a former Walgreen’s drug store. The church was developed to help the impoverished 9th ward community as it rebuilt, and it now distributes food and other necessities to families in need, offers tutoring, a Saturday music program for kids intended to keep them off the streets, a Saturday breakfast and dinners for 30-40 kids at a time. In New Orleans, Family-to-Family partners with Winn Dixie grocery stores to provide groceries for our sponsored families.